Any outdoors person should know that bears like camp food, and it is difficult to dine in the bear country once the bears smell your food. The development of bear-resistant containers has significantly reduced bear-human encounters and bear inflicted injuries. The use of canisters is direct results of changes in the manner humans handle food and garbage. Most National Parks across the United States have seen bear-inflected injuries drop considerably over the years. However, choosing the best bear canister is the most challenging thing for most outdoorsmen. This post is particularly designed to help you make the best choice. The list of product reviews provides you with reliable buying information. 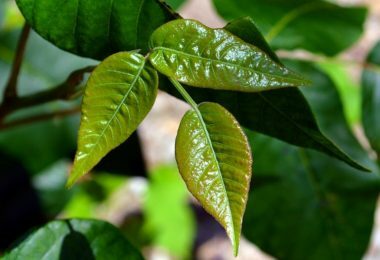 The best material is one that is environmentally friendly, easy to clean & maintain, and is not easily affected by temperature changes. However, you should know that most bear resistant containers are not particularly designed to keep perishable foods fresh at all times. In fact, the most recommended foodstuff that you can effectively pack in these cans is dried or dehydrated food. Go for a heavy-duty plastic material with a smooth finish, such as polymer or polycarbonate material. You can also opt for stainless steel material, which is highly durable and keeps hot fillings warm and cold fillings icy cold. Generally, the material selection depends on personal preference. 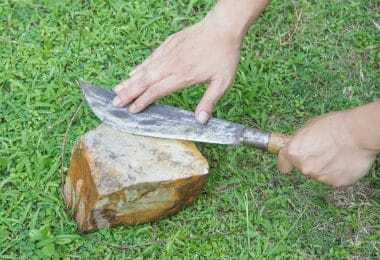 This is a very important factor as far as resourcefulness and versatility are concerned. You need to go for a design that is practically impossible for bears to hold and maintain a grip. The main purpose of a bear canister is to restrict bears access to your food. Well, they cannot access the food if they cannot maintain the appropriate posture of the container. Most cans are cylindrical with top lids. Go for a model that is cylindrical, and has a smooth surface with rounded edges. Smooth surface and rounded edges discourage bears from holding the container. The lid’s locking system should be easy for you, and hard for the bear. Most containers are locked with two to three stainless screws, which you can easily lock or unlock with the help of a small coin. Consider using canisters in places where there are no trees to hang your food. It is important to store your food in special bear-resistant containers. Commercially produced cans are made of aluminum, stainless, or polymer blends, and they range in size from approximately 400 cubic inches to 1,000 cubic inches. 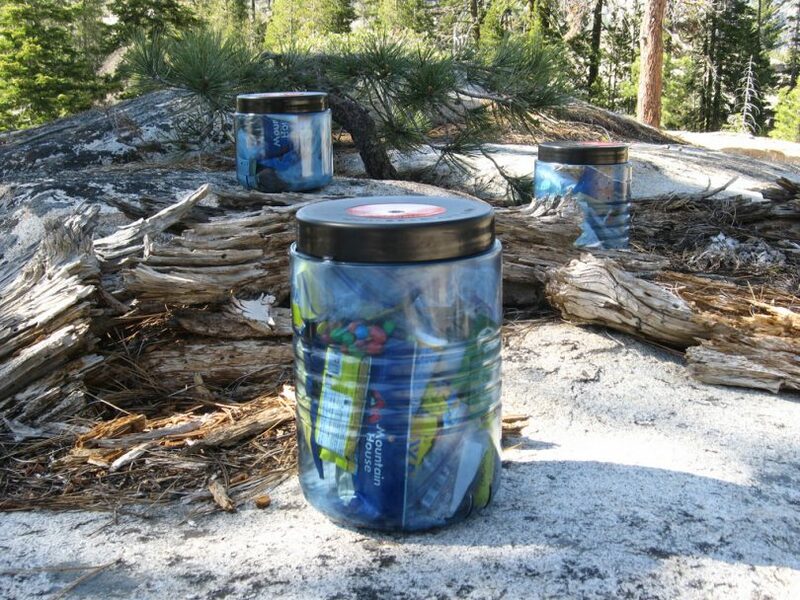 Make good use of the bear-resistant cans/ boxes offered at many trailheads to safely secure food, along with other distinctive smelling items. As far as most bear country areas are concerned, Forest Service in conjunction with National Park Service needs tourists, hikers, and campers to carry preapproved bear-proof canisters. 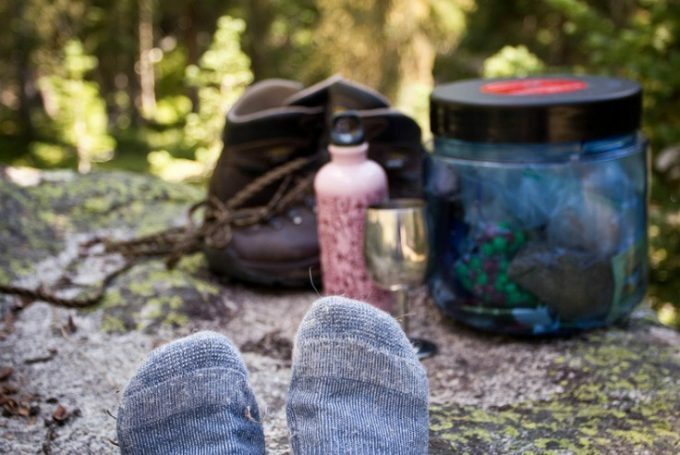 Always check with the necessary agencies, such as the United States Forest Service to determine the trails you are expected to carry your own bear-proof food cans. 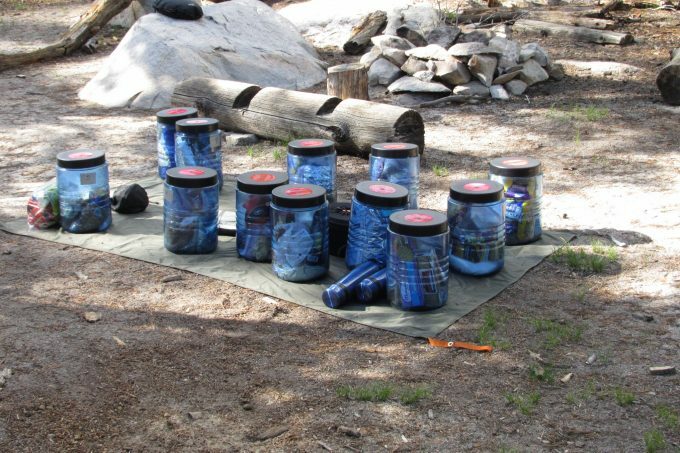 Usually, portable canisters are available for renting or purchase from National Park visitor centers or Forest Service centers. Most National Park Services have bear-resistant cans placed at specific wilderness locations that are well-recognized for bear encounters. 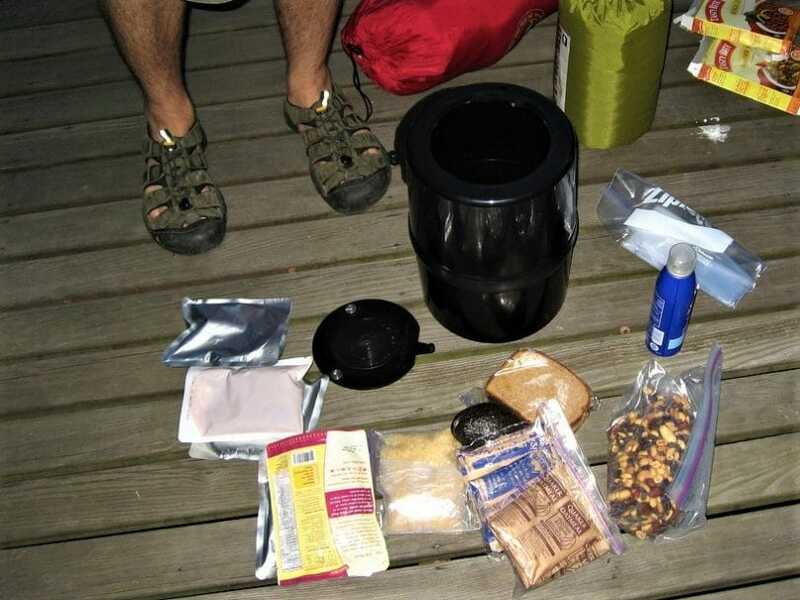 If you are used to food bags and you are new to bear canisters, you need to counterbalance your food bags by practicing the skill of using bear-proof containers when backpacking food. Remember to clean up food residue before you go to sleep or leave camp. Forgetting to do so may make you lose all your food to the ruthless bears. 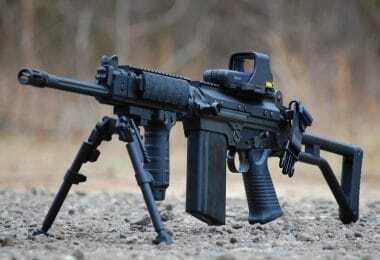 In worst cases, you may encounter them and put your life or your family’s life in danger. One of the mistakes that you should never make is overlooking proper disposal or storage of toiletries, garbage, and non-food smelling items. Bears are sensitive to smell. Therefore, avoid any and every reason of them entering your campsite. If possible, set your campfire a few meters away from your camp. This way, you will create a safe distance between your sleeping grounds and possible bear attack location. Features: Black, ABS polymer, 614 cubic inches capacity, lightweight, & one size. 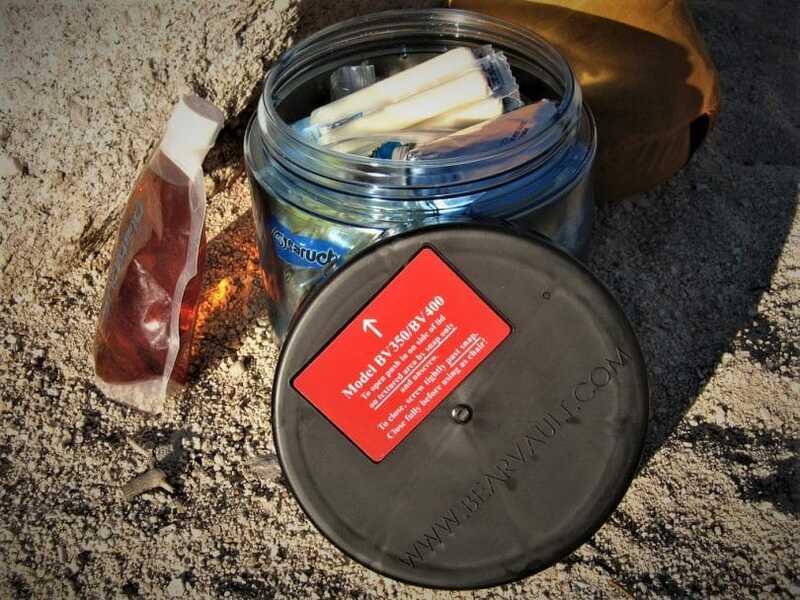 Description: Backpacker Food Cache is a lightweight, heavy-duty container that any camper or backpacker can count on as far as safeguarding food from animals is concerned. With the use of this canister, unexpected human/bear encounters have significantly reduced, because bears/other animals are usually attracted to the uncovered food. The can is made of ABS polymer material, which provides an impressive list of benefits similar to other plastic materials. This material also offers low thermal conductivity; excellent integrity; and superior abrasion, corrosion, and chemical resistance. ABS polymer offers one of the widest temperature ranges of any polymeric substances. There is nothing lighter in weight than ABS. Also, the inner and outer layers of the container are solid and rigid, making it the right canister for an outdoor environment. It has a capacity of ten liters, which is more than enough for backpacking. It may look simple; however, it is a sturdy container and the ideal choice for short camping trips in the country. 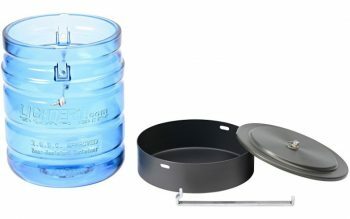 It has a bowed-out middle design that can hold a week’s worth of dehydrated food. Its top is fastened tight by a couple of locks, which you can effortlessly open with the help of a small coin. Features: Canister pot/ pot lid/ handle; colorless pot & black handle; 300 cu in capacity; 850 ml pan capacity; & polycarbonate material. Description: Lighter1 LIL’ SAMI is an ultra-light bear container for the money, which is not only resourceful but also highly versatile. Unlike other cans, you will observe the difference from the moment you lay your eyes on it. It is made up of a canister pot, handle, and pot lid. The pot or pan has a holding capacity of 850 ml, and it measures 6.9 by 2 inches. The can has a holding capacity of 5 liters, which is enough for storing 72 hours’ worth of food. The combined weight of the canister, pot, and handle is 1 lb. 12 oz. The cooking pan is made of anodized aluminum, weighing only 6 ounces. This material is highly resistant to corrosion among other corrosive conditions. The can is made of polycarbonate material, which is a high performing thermoplastic substance for demanding environments, such as bear country. With all these features, the Lighter1 LIL’ SAMI is the most ideal to buy for your backpacking gear. You will love this container compared to other models you have tried. You can easily backpack it; just place it upside down at the bottom of your backpacking bag. Unlike cans that are fastened with screws, this particular model does not use screws and it is extremely easy to remove the lid. 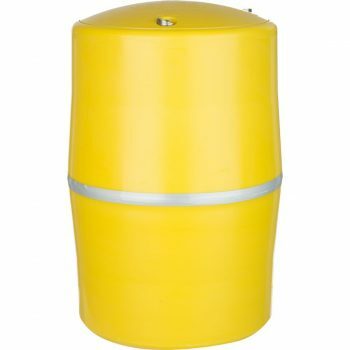 Features: Bright yellow in color; proprietary polymer blend material; 716 cu in capacity; secure three-latch lid; & meets US Forest Service specifications. Description: Counter Assault Food Keg is a highly resourceful bear resistant food container for the money. This is a bright yellow can that measures 14 by 9 inches. It fulfills specs requirements by United States Forest Service, and you are required to carry it when touring National Parks in the U.S. In point of fact, the keg is qualified by the Interagency Grizzly Bear Committee, along with the Sierra Interagency Black Bear Group. Weighing only 3.5 pounds, it provides you with a carrying capacity of seven hundred and sixteen cubic inches, which is equivalent to about three gallons. This heavy-duty bear resistant keg is engineered from proprietary polymer blend material. It is made of proprietary polymer blend, which is highly versatile and strong. The interactive combinations of ingredients in the blend optimize orthogonal qualities, which includes increased toughness and improved biodegradability. The proprietary polymer blend material is bright yellow in color which makes locating the can easy. The lid is well-fastened with three screws, which you can easily unscrew with a small coin or a screwdriver. It is spacious enough to store about a week’s worth of foodstuff. The design is incorporated with smooth sides along with round edges, which are extremely difficult for bears to hold. Bears cannot under any circumstances open the 3 stainless-steel screw locks. You will not have any problems carrying the container because you can obtain an optional carrying case for strapping or backpacking. The carrying case is zippered, and has a single grab-handle in addition to 2 28” adjustable straps and 4 webbing tabs. Features: Shatter-proof, airtight, & leak-proof; bulk ready & grease pencil friendly; 100% stainless interior; stackable-elegant design; and capacity of 473 ml. 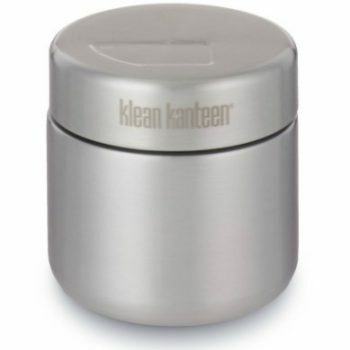 Description: Klean Kanteen food canister is equipped with a stainless steel lid. This container replaces a generation of throw-away paper and plastic bags and containers. It is designed to keep the food safe, icy cold and toasty warm all through your expedition. Apart from backpacking and camping, you can use this container to carry food to National Parks, work, and school. This particular model weighs 16 ounces, measures 5.5 by 3.7 inches, and has a total capacity of 473 ml. It is made of 18/8 food grade stainless material, which contains 18% chromium and 8% nickel. The material keeps hot foodstuff hot and cold foodstuff cold. It is a kind of a double-wall, stainless steel material that operates like a vacuum keg, protecting fillings from swift temperature changes. The design is elegant and reliable for carrying food to different environments, including work; school, home, National Parks, and campsites. In fact, the container’s design is handcrafted and solid with rounded corners for easy cleaning and maintenance. The interior is 100% stainless; therefore, it doesn’t impart or retain flavors. The mouth of the can is wide-opening for easy pouring, filling, and scooping. You will love this container – it is incredibly durable, sturdy, and heavy. The 473ml capacity can easily hold a 473ml amount of food. The insulated lid is filled with recycled, exceptionally efficient, corrugated cardboard and environmentally friendly solution. The double-wall construction ensures food remains hot or cold for approximately eight to twenty two hours. Once sealed, the canister is shatterproof, airtight, and leak-proof. Features: Black color & red lid; stores inside/ outside of your pack; built of heavy-duty polymer; highly bear resistant; comes with nylon case and 32-page safety booklet. 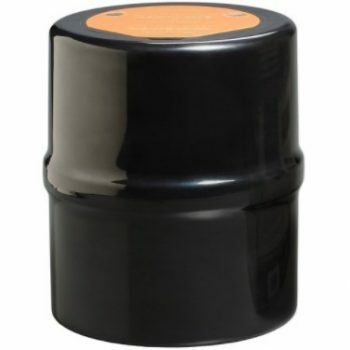 Description: No-Fed UDAP container is heavy duty and highly bear resistant. The construction is fully plastic, there isn’t any metal included. It has a cylindrical shape with rounded edges, which makes it completely difficult for bears to hold with a strong grip. The body of the can is made of durable polymer material, which provides you with the following qualities: toughness & durability; low thermal conductivity; low density; and high corrosion resistant. NO-FED-BEAR is engineered to provide you with quality and safety, making it an ideal canister for the toughest bear environments. It does more than keeping bears off your food, it actually safeguards your family from any kind of food contamination while in a National Park or in the wild. You will notice that the lid is made of plastic with a bear symbol and the container’s name among other details. The lid is fastened with a couple of white plastic screws that you can easily unlock with a small coin. 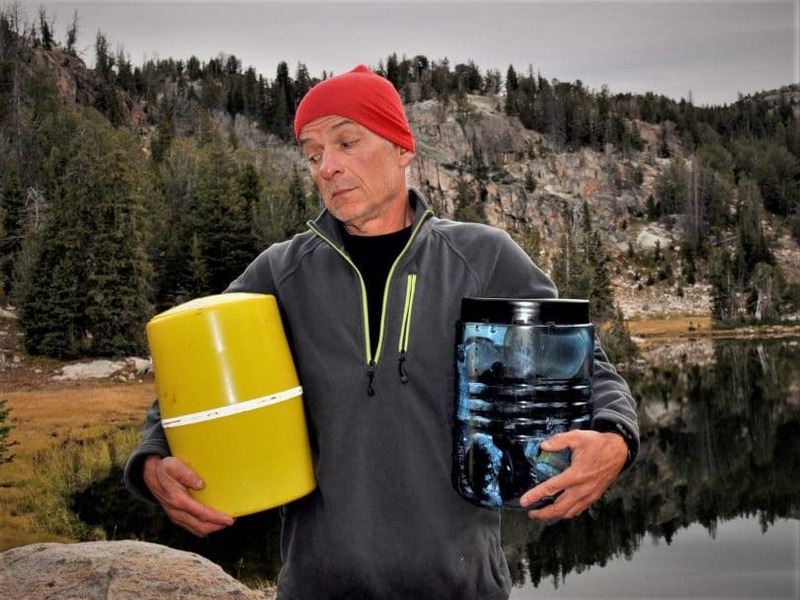 You can take this canister on a four-day expedition in bear country. It will hold most of your food for at least four days. You should expect some added weight from it as far as backpacking is concerned. However, the benefits overshadow all that. It is not only beneficial to car campers; it is also among the best bear resistant containers for motorcycle adventure trips. It has a middle rib, which allows you to hang it on trees with the help of parachute cord. Features: Black with a brownish lid; 432 cubic-inch capacity; 3 stainless steel locks; smooth design with rounded edges; and durable plastic material. 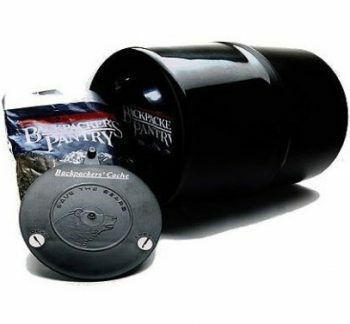 Description: Frontiersman Bear Resistant Food Canister is specifically designed to keep bears off your food. Unlike most food storage containers, this model has a smooth structure with rounded edges and middle rib, which make it practically impossible for bears to hold. The brownish lid is fastened with three stainless locks, which you can easily open with the help of a small coin. It minimizes the possibility of bears or any other animals from entering your campsite by eliminating any food odors, and restricts the animals from accessing your food. The design is in agreement with United States Forest Service specs for use in bear country and National Parks. Measuring 10 by 8.5 inches, Frontiersman has a capacity of 432 cubic-inches, which allows you to pack a few days’ worth of food. The lid is highly ergonomic; you can easily fasten it with the three stainless locks, which you can effortlessly unlock with the aid of a small coin. The opening is wide enough, making it easy for you to access the food. It is somehow bulky for packing, especially when you are on a solo trip. You might feel the added weight, but it is still one of the best canisters to bring along when touring National Parks and bear country. You should definitely get this if you are a hunter, backpacker, fisherman, or National Park tourist/camper. 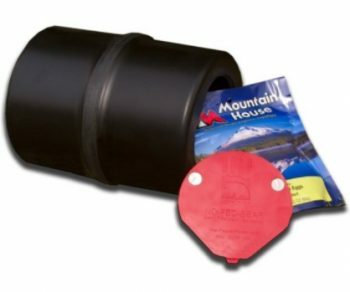 Bear-proof canisters are not perfect, but they work very well when used appropriately. Using a bear container is much easier, and more secure than counterbalance bear bagging. They are lightweight, waterproof, resistant to corrosion, easy to lock and unlock, and extremely easy fill. The best way to get rid of bear-human encounters, and ensure success of your trip is proper food, toiletries, and garbage storage. You should never, under any circumstances, overlook the importance of bear-resistant canisters when visiting National Parks and bear country in general. Do you think we have missed any resourceful canisters? If so, please let us know in comments.